The Event Aggregation QuickStart sample demonstrates how to build a composite application that uses the Prism Library’s Event Aggregator service. This service enables you to establish loosely coupled communications between components in your application. The Event Aggregator is a Portable Class Library (PCL) so it can be used on WPF, Windows Phone 8, and Windows Store apps. 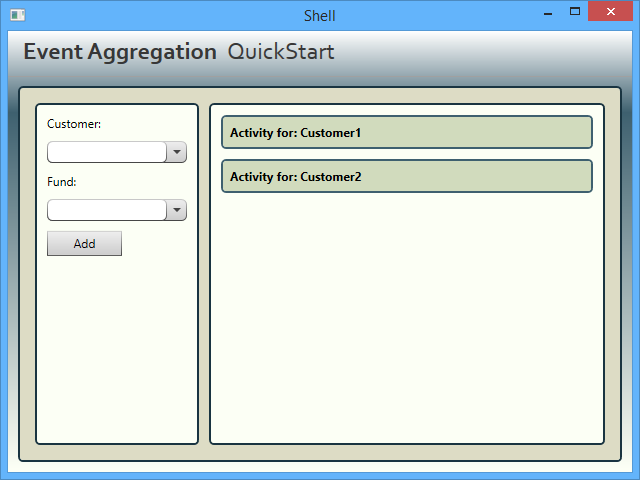 The main window of the Event Aggregation QuickStart represents a subset of a fictitious financial system. In this window, users can add funds to customers and see the activity log for each customer. The following illustration shows the QuickStart main window. This QuickStart requires Visual Studio 2012 or later and the .NET Framework 4.5.1 to run. In Visual Studio, open the solution file Quickstarts\EventAggregation\EventAggregation_Desktop.sln. Press F5 to run the QuickStart. The QuickStart highlights the key elements that interact when using the Event Aggregator service. This section describes the key artifacts of the QuickStart, which are shown in the following illustration. The FundAddedEvent event is raised when the user adds a fund for a customer. This event is used by the modules ModuleA and ModuleB to communicate in a loosely coupled way. The following code shows the event class signature; the class extends the PubSubEvent<TPayload> class, specifying FundOrder as the payload type. This code is located at EventAggregation.Infrastructure.Dektop\FundAddedEvent.cs. The following code is the class definition for the FundOrder class; this class represents a fund order and specifies the ticker symbol and the customer's identifier. This code is located at EventAggregation.Infrastructure.Desktop\FundOrder.cs. When the user adds a fund for a customer, the event FundAddedEvent is published by the AddFundPresenter class (located at ModuleA.Desktop\AddFundPresenter.cs). The following code shows how the FundAddedEvent is published. In the preceding code, first a FundOrder instance is created and set up. 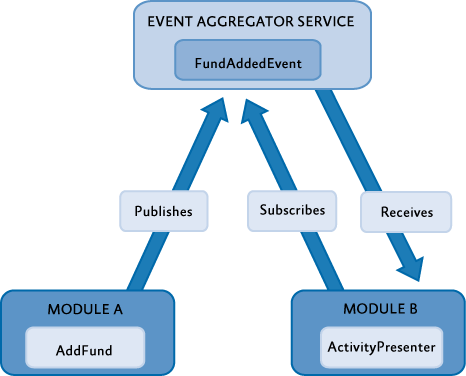 Then, the FundAddedEvent is retrieved from the Event Aggregator service and the Publish method is invoked on it; this supplies the recently created FundOrder instance as the FundAddedEvent event's parameter. The ModuleB module contains a view named ActivityView. An instance of this view shows the activity log for a single customer. The ModuleB initializer class creates two instances of this view, one for Customer1 and one for Customer2, as shown in the following code (this code is located at ModuleB.Desktop\ModuleB.cs). When an instance of the ActivityView view is created, its presenter subscribes an event handler to the FundAddedEvent event using a filter expression. This filter expression defines a condition that the event's argument must meet for the event handler to be invoked. In this case, the condition is satisfied if the fund order corresponds to the customer associated to the view. The event handler contains code to display the new fund added to the customer in the user interface. The following code shows the CustomerId property of the ActivityPresenter class. In the property setter, an event handler for the FundAddedEvent event is subscribed using the Event Aggregator service. The following line, extracted from the preceding code, shows how the event handler is subscribed to the FundAddedEvent event. The FundAddedEventHandler action. This event handler is executed when the Add button is clicked and the filter condition is satisfied. The ThreadOption.UIThread option. This option specifies that the event handler will run on the user interface thread. The KeepSubscriberReferenceAlive flag. This flag is false and indicates that the lifetime of the subscriber's reference is not managed by the event. This is set to false because the lifetime of the subscriber, the presenter class, is managed by its view, which contains a reference to it. The filter predicate. This filter is a condition that specifies that the event handler is invoked only when the fund is added to the view's corresponding customer. The Event Aggregator QuickStart includes unit tests within the solution. Unit tests verify if individual units of source code work as expected. On the Test menu of Visual Studio, point to Run, and then click All Tests. You should see the Test Results pane in Visual Studio indicating that all the unit tests passed. The Event Aggregator QuickStart includes a separate solution that includes acceptance tests. The acceptance tests describe how the application should perform when you follow a series of steps; you can use the acceptance tests to explore the functional behavior of the application in a variety of scenarios. In Visual Studio, open the solution file QuickStarts\EventAggregation\EventAggregation.Tests.AcceptanceTest\EventAggregation.Tests.AcceptanceTest.sln. After building the solution, Visual Studio finds the tests. Click the Run All button to run the acceptance tests. You should see the QuickStart window and the tests automatically interact with the application. At the end of the test run, you should see that all tests have passed. For more information about event aggregation, see Communicating Between Loosely Coupled Components.